It's time for another Nails Talk post and I'm really excited about this post because the brand I'm writing about is new to Nails Talks! Liquid Sky Lacquer is an indie brand that is new to me and I first got to know about it on Instagram. 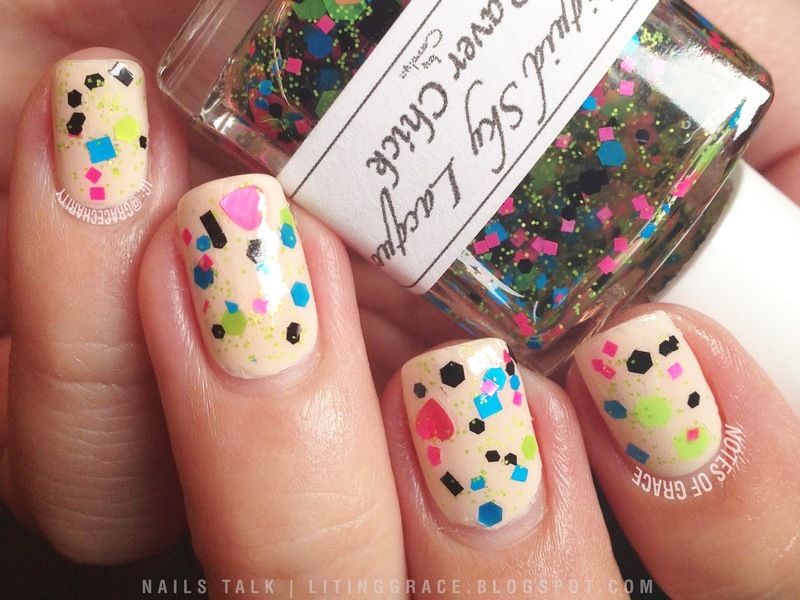 It's time for another Nails Talk post and today's post features yet another indie brand that's new to me. Liquid Sky Lacquer originated from the San Francisco Bay Area, California and it's polishes are all handmade by it's creator, Carolyn. Liquid Sky Lacquer polishes are made with "three free" base meaning it's free from Dibutuyl Phthalate, Toluene and Formaldehyde Resin and contains stainless steel mixing beads as well. I learned about Liquid Sky Lacquer from Instagram and was blown away by some of the amazing creations by Carolyn. When Mei Mei contacted me to do a review, I accepted it without any hesitation. 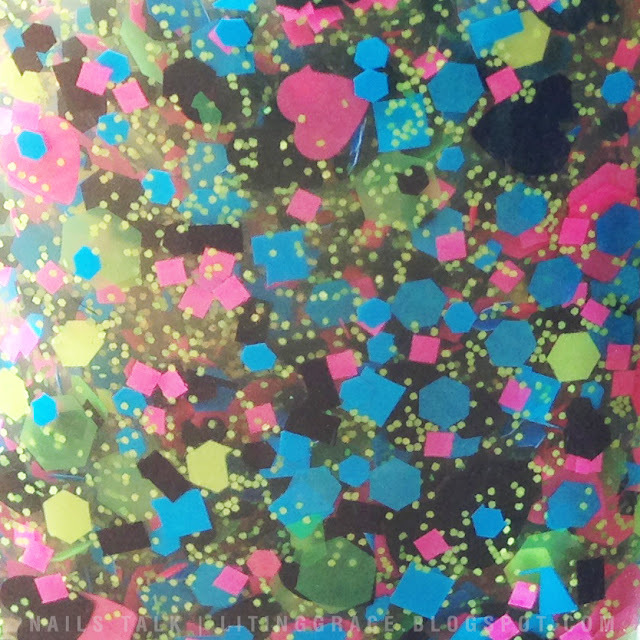 Raver Chick is described as a glitter bomb with neon pink large hex, hearts and small hex and squares, neon green medium and large hex, fine neon green glitter, blue neon small hex and medium squares and hex, black hearts (unfortunately, I didn't managed to get any of this), medium and small hex, rectangles and squares. In case you are confused by the description, here's a shot of the glitter bomb. What I love about glitter toppers are the limitless layering options; for this post, I was able to create as many as three different looks with Raver Chick. 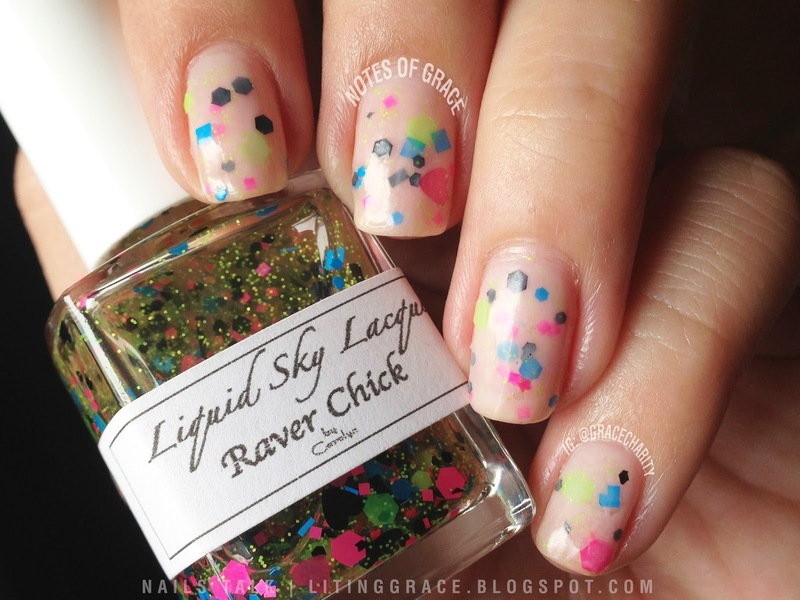 For the first look, I layered Raver Chick over OPI My Vampire is Buff. The neon glitters really pop against a light base. For the second look, I chose to layer Raver Chick over Catrice Shopping at Bluemingdales and this was the combination was the one I loved most. For the third and final look, I created a jelly sandwich, layering it between two coats of OPI Care to Danse. Somehow it didn't look as nice as it did when I was thinking about it. Formula wise, because of the large amount of glitters, the glitters had the tendency to sink but that was easily solved by giving the bottle a good shake. Application was smooth, but I did had to fish around for the larger glitters and a little dabbling was unavoidable. That said, if you are looking around for a glitter topper, I would recommend Raver Chick. 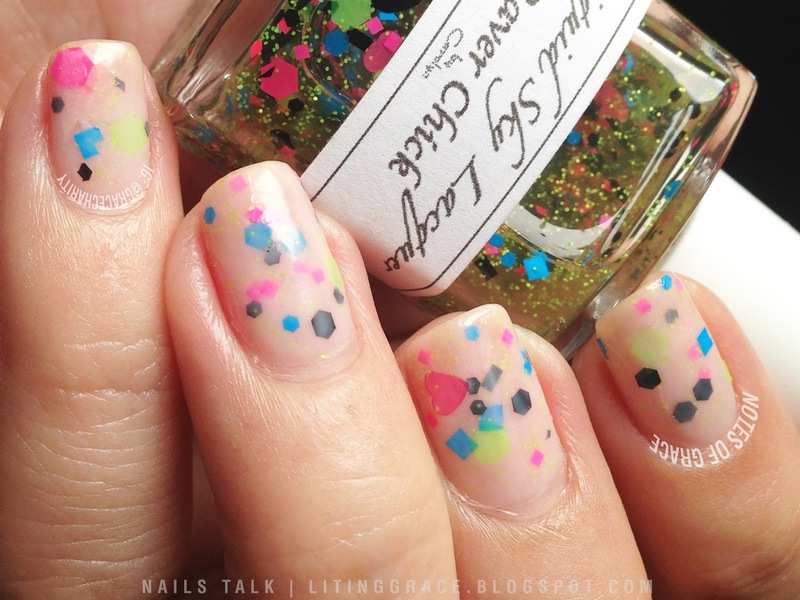 It's still one of the gorgeous glitter topper that I have come across so far. Liquid Sky Lacquer polishes are retailing at Mei Mei's Signatures for SGD15.00 each (local normal postage included) and the prices for a couple of them including Raver Chick have been lowered so it's a good time to stock up now. International shipping is also available. 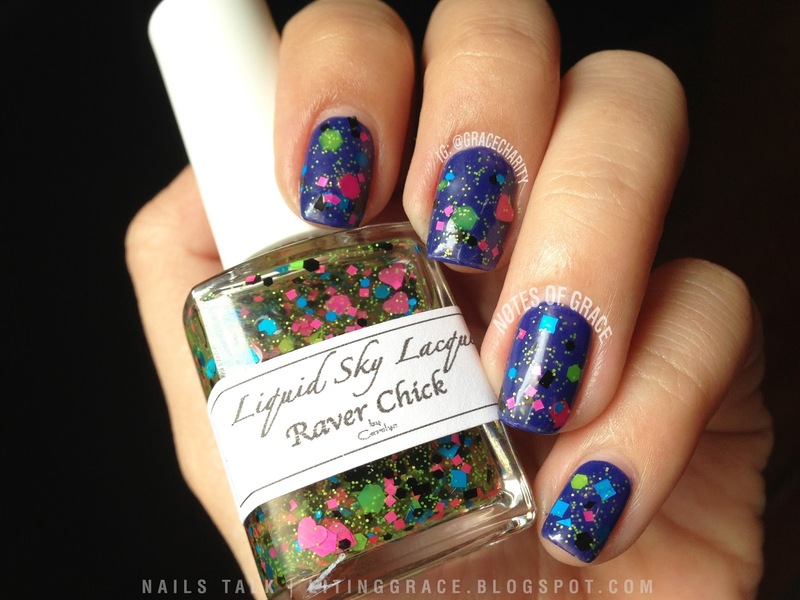 You can also purchase them at Liquid Sky Lacquer's store here. For more updates and information on Liquid Sky Lacquer, do like the respective page on Liquid Sky Lacquer Facebook page and Mei Mei's Signatures Facebook page. Alternatively, you may also follow them on Instagram here and here.